Eddie visited The Scuba Club back in his early teens with his dad and we don’t remember him but we sure do now. He started full time several years ago and squeezed in to part time after landing a job as a yacht captain. Growing up in Huntington, Long Island prepared Eddie for a career on the water. He graduated from University of Buffalo and realized that the brutal winters were not going to play a part in his future, so he moved to Palm BeachGardens. 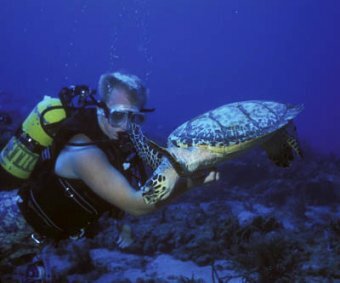 Working at The Scuba Club gave him time to become a USCG Licensed Captain and a PADI Scuba Instructor. Also in all of his spare time he attended FloridaAtlanticUniversity and completed a Masters Degree in Business Administration. A man on a mission! When he is not running the Loggerhead III, diving or captaining a big yacht you can find him playing with his golden retriever Breaker. When we say water dog, we mean he is wet constantly and loves to play with The Scuba Club dogs. Eddie’s hobbies include diving, underwater photography, lobster catching (he doesn’t eat them, but gives them away), golf, camping, ice hockey, poker, and he is a world class skier. Eddie always brings a smile to our faces and all of our divers enjoy having him on the boat.